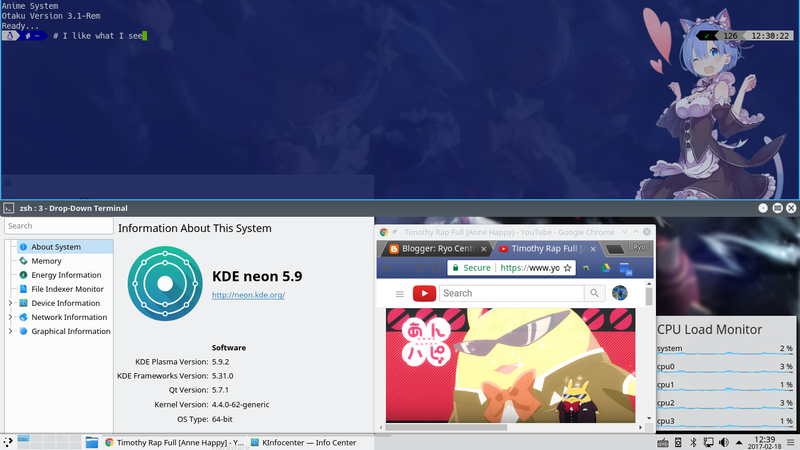 Yesterday I took the step and dared to upgrade a live system from Kubuntu 16.04 to KDE Neon 5.9. I didn't do a clean install to save work. Again it turned out after several update/upgrade cycles, and force install neon-desktop with sudo apt install neon-desktop -f , the system rebooted without issues and I could go on. I still get 2 error messages regarding korcag and kgpg. The first issue doesn't seem to have something to do with the upgrade and the kgpg is to be investigated. Since the major programs like kdenlive and the multimedia players works, it seems to be consistent so far (fingers crossed). No dependencies left over. I like what I see on the new Plasma desktop and I like to have the latest version of KDE running on top of a stable LTS base. So while the KDE team says that KDE neon is not a real distribution, for me it is and should be presented like it. Let's see how this works out over time. For now my needs are satisfied.